The United Arab Emirates has announced its plan to build a "pedestrian city" — a gargantuan mall that will take up over 48 million square feet. Remarkably, the facility will feature a temperature-controlled domed retail street network that will extend for 4.3 miles (7 km). Called the "Mall of the World," the Dubai-based facility will contain the world's largest shopping mall and an indoor theme park covered by a retractable glass dome that opens during winter months. The plan also provisions for a 3 million square feet wellness center, a cultural celebration district, serviced apartments, and a wide selection of hospitality options that will include 20,000 hotel rooms. The shopping area will be based on London's Oxford Street and a theatre district modelled around Broadway in New York. "We announced recently that we plan to transform Dubai into a cultural, tourist and economic hub for the two billion people living in the region around us; and we are determined to achieve our vision," noted PM Mohammed Bin Rashid in a Dubai Holding statement. "We are confident of our economy's strength, optimistic about our country's future and we continue to broaden our vision." UAE Minister of Cabinet Affairs Mohammed Al Gergawi added that: "The project will be built in phases in alignment with the gradual growth of family tourism in Dubai." News of the project, which was announced to great fanfare in Dubai over the weekend, marks a return to the headline-grabbing mega projects that defined the desert state's rapid and extravagant development until the 2009 financial crash hit the property market. That sparked a debt crisis that resulted in many large-scale projects having to be reduced in size or scrapped altogether. 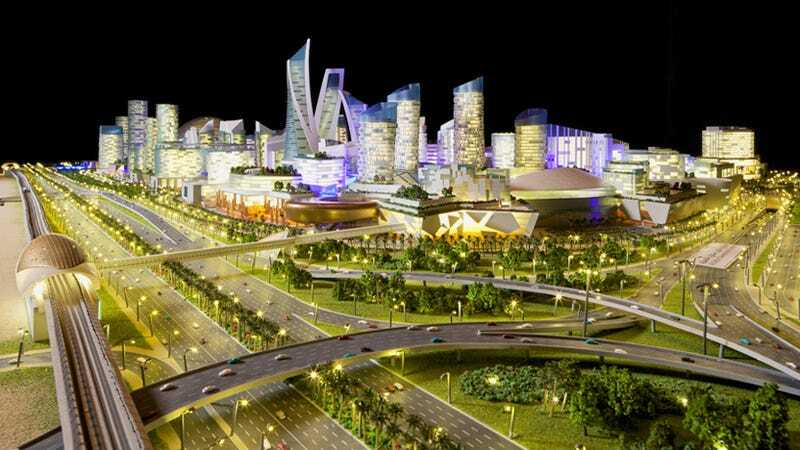 The Mall of the World, which was unveiled by Dubai's ruler Sheikh Mohammed bin Rashid al-Maktoum, is designed to help the city become a year-round destination that authorities hope will pull in 180 million visitors annually when it is completed. The Sheikh owns the company responsible for the development. The facility is expected to be Dubai's primary focus at the UAE World Expo trade fair in 2020. But details of the timeframe and the cost of the project have yet to be released.